Before you can get out of debt you must learn how to think about money, especially how to have a money mindset that will cause you to make debt elimination a number one priority. For this reason, understanding the psychology of money as it relates to our ideas about debt is crucial. To borrow Zig’s phrase, when it comes to money there is a lot of stinkin’ thinkin’ going on. Nowhere is this more true than when it comes to borrowing money. One of the great truths relevant to personal achievement is the fact that if you keep on doing what you are doing now you will keep on getting the results you are getting now. If people keep thinking about debt the way the way most do now, they will continue to have the same success at becoming debt free that they are having now. Not much. It is certainly true that if people keep thinking about debt the way the way most do now, they will continue to have the same success at becoming debt free that they are having now. Not much. It is because they do not value learning how to get out of debt. In this article we will look at the psychology of money as it relates to debt, the kind of money mindset that keeps people enslaved to the confines of debt. Then we will consider the kind of thinking that can help us escape that trap and move on to success with our money. Understanding how the mind works is crucial if we want to change any part of our lives, but especially so when it comes to with debt. By looking at the psychology of money we see that we cannot change our debt habits without changing our thinking about debt itself. We don’t always get what we want in life but we always get what we expect. People who study the mind and how it works have determined a few things that are indisputable. One is that no person can consistently act outside the confines of their internal beliefs. As I often express it, we don’t always get what we want in life but we always get what we expect. Everything about your financial life grows out of your inner (subconscious) beliefs about money, your money mindset. If you believe buying on credit is the only way to get by you will buy on credit. If you believe buying on credit is an unnecessary and self-defeating habit, you will avoid it. The conscious mind can override the subconscious belief system temporarily, but as soon as the mind loses its focus old behaviors reestablish themselves. Knowing this, it is important to identify the kind of thinking that is harmful and learn how to replace that kind of thinking with a more helpful process. By considering the psychology of money we can readily identify the typical thinking that leads to debt. You will hear expressions of it everyday. The prevalence of this kind of thinking explains why debt has become such a major problem today. One false but common idea is that debt is necessary at all. Most people in fact just accept the fact that cannot exist without it. It is accepted as a necessary evil. 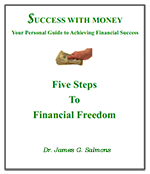 The truth is that you do not have to borrow money to be successful financially. It is clearly possible to do everything you need to do in life without ever borrowing a nickel. Ever. It is clearly possible to do everything you need to do in life without ever borrowing a nickel. Ever. My parents demonstrated this in their own lives. They never once sought credit for anything. As a result they were able to save for whatever they needed. And though they never had high paying jobs, they always had what they needed. This did not even prevent them from owning their own home. I remember as a child their buying first a “fixer upper.” We leveled the floors, redid the sheetrock, painted, etc. Then sold it. They added savings accumulated in the meantime and purchased another home. Later, they added on to it. This is not to say that some loans or specifically a mortgage are never justified. It is simply to make the point that using credit is not necessary. It is not a necessary evil. It is just not a necessity at all. Another idea that is particularly destructive centers on a clearly false concept, the idea that using credit allows people to have more than they would otherwise. People seem to readily adopt this illogical idea because if offers instant gratification. Obviously, if one person pays $100.00 for an item and another pays $125.00 by using credit, the person who pays $25.00 less has $25.00 more to spend. And when debts compound and compound it gets worse and worse. When you finance something like a car over several years you end up paying thousands of dollars in interest. When you finance your house for thirty years you end up spending several times more money for the interest than for the house! The simple truth is that the person who pays cash can spend more than the person who buys on credit and have money left over to save for every need, including retirement. The simple truth is that the person who pays cash can spend more than the person who buys on credit and have money left over to save for every need, including retirement. No truth is more certain. A whole host of false beliefs center around the idea of “need.” For most people there is no difference between need and want—if they want it, it is a need! This is a self-defeating mindset. If we really want to become successful with money, if we really want to stop over spending, we have to learn to distinguish between wants and needs. If we really want to become successful with money, if we really want to stop over spending, we have to learn to distinguish between wants and needs. It is one of the critical factors in getting out of debt and keeping out of debt. There are other self destructive thinking habits that limit our financial success as well. You will learn them as you study the Laws of Money. These are the primary culprits and if you deal with them you will be moving in the right direction. Remember the elephant we mentioned in the introductory article for this series? The reason we cannot manage not thinking about the elephant is that our minds are not created to not work. With some discipline we can resist making a purchase, temporarily, but even that leaves us with the inner thought that we really want to buy it. So we do so the next time we encounter an opportunity. You already realize that debt, certainly consumer debt, is a bad idea. At least I hope you do. But no matter how often you emphasize that idea to yourself, your subconscious mind just focuses on the words debt and want or need. It never hears the words good or bad, yes or no. The subconscious mind acts consistently to bring about whatever you think about without regard for whether it is positive or negative. So you think you are telling yourself you don’t want debt but soon you will have debts, plenty of them. Simply substitute the productive thought you want to make a priority for the destructive one that is causing you harm. Now for the really good news. You can change the whole situation by changing the thought process in this way. Simply substitute the productive thought you want to make a priority for the destructive one that is causing you harm. Elevate positive wants into needs at the same time you reduce imaginary needs into wants. This reversal of priorities will change the way your subconscious mind works. It will cause your subconscious to work for you instead of against you. If this sounds like theoretical gobbledygook, it isn't. Make it practical. This is how it can be done. Reduce needs to wants first by changing your vocabulary. Every time you say you need something, stop. Think it over. Do you really need it, or just want it. The truth is, needs are few. Restate your thought. Remind yourself that it is just a want, not a need. Let your buying decision be influenced by that reality. Next, elevate real needs to their appropriate level of importance. Make a list of your new financial priorities. Like what? Like these, stated as affirmations. I need to have enough money in the bank to pay my bills on time with a little cushion in case of bookkeeping slip ups. I need to have enough reserves to cover any unexpected expenses like car repairs or furnace replacement. I need to have the peace that one feels when there are no worries about some income arriving on time because there is money in the bank. I need to have a certain adequate amount of money into my retirement account each month so I can retire when I want. I need to have the joy, the peace and satisfaction that only comes to those who feel they are managing their money in a competent, productive manner. In the suggested list, some of these call for specific amounts of money. For example, an emergency reserve might call for $2,000.00 for some, more or less for others. Each person must decide on a given amount. It is important to be specific in these cases so that there is a clear point at which money is available to spend. It is important that you review your list regularly, read it aloud, instill it into your thinking until it is all automatic. Whenever an opportunity arises to spend money there should always be an evaluation of the financial implications. Decisions will be appropriate when priorities are appropriate. IMPORTANT! In computer circles when something is in all caps it is often referred to as “shouting” and is generally frowned on. But I put that word in all caps because I am shouting! The following point is just that important. One of the greatest truths that you can discover in your quest to get ahead financially is that the amount of over spending required to acquire the average eight to ten thousand dollars of debt families can and do have in this country (America) is only ten to fifteen dollars a month! Let that incredible fact soak in. Don't scoff or in disbelief ignore this truth! Check it out for yourself. The “miracle of compound interest” works in both directions, savings or debt. If you over spend each month and continue to pay interest on that credit card debt, it compounds at an alarming rate. Here is an example: I have used $20 over spending a month at 14% interest (average credit card rate) for 20 years. Think about how little adjustment you would need to make in your monthly spending to compensate for any amount you may be over spending and get out of debt completely. Think how little you would have to reduce your credit card debt to save twenty dollars each month just from lower interest charges. It is only essential at this point to discover the amazing and happy truth that overall you only need to reduce spending a few dollars a month to start moving in the direction of all of these worthwhile financial goals. You can probably do that easily. As soon as you have reduced your debt just a little you will actually able to buy more than people who are not on your course. And as soon as you have reduced your debt just a little you will actually able to buy more than people who are not on your course., At the same time you are moving effectively toward your underlying goal of debt elimination. This is the positive mental message that must underlie all of your self-talk. If you are questioning this because you typically over spend by buying items that cost more, don't be fooled. Some months you go over a good bit and other months you spend less than you earn. But the average amount of over spending is clearly a very small amount or you would owe many times more than you do. The typical problem that people have is that savings in one area are lost in another. You can feel positive about your debt reduction program when you realize that it doesn’t take a lot more money coming in or a large amount of cut backs in expenses. What it does take, however, is a commitment to take charge of your money and a sincere desire eliminate debt. Remember, you don’t always get what you want in life, but you always get what you expect. Start expecting to be successful with your money. Start expecting to get out of debt. When you do that you can be confident that it will only be a matter of time until your goals are realized. If you understand the psychology of money (and of debt in particular as we have discussed it) and have chosen the right money mindset, you are now mentally prepared to learn how to get out of debt. In the next article, Learn to Live on Less than You Make, I will show you how to avoid letting money slip through your fingers and begin to get in real control of your income.